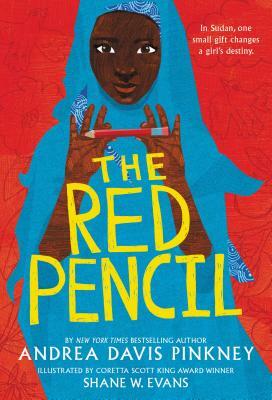 The Red Pencil (Hardcover) | Let's Play Books! Andrea Davis Pinkney is the New York Times bestselling and award-winning author of more than 20 books for children, including Bird in a Box and several collaborations with her husband Brian Pinkney, including Sit -In, Hand in Hand,and Martin & Mahalia. She lives with her family in Brooklyn, NY. Shane W. Evans is the illustrator of many books for young readers, including Underground: Finding the Light to Freedom, which won a Coretta Scott King award, and Nobody Gonna Turn Me Round, which was nominated for an NAACP Image Award. His website is ShaneEvans.com. "Pinkney faces war's horrors head on, yet also conveys a sense of hope and promise."